Hubby and I always wanted to sow our own fruits and vegetables whenever the weather permits us to plant. 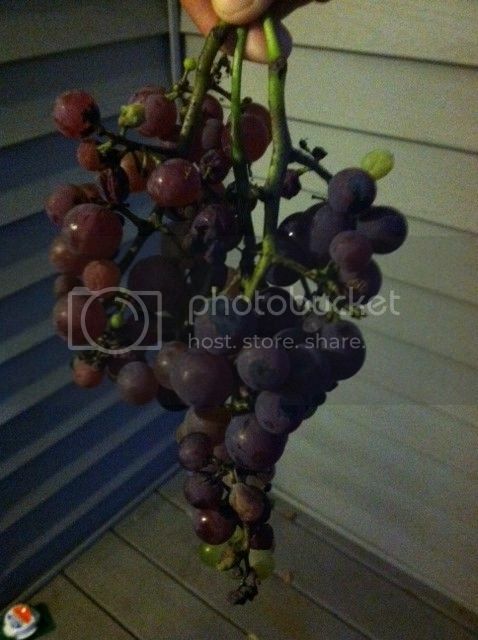 We started it with buying a grape plant from the store and planted it in our old apartment. We never thought we will be moving out from that place and decides to reside in another place, which I presume would be the last house we are going to purchase. So, all the outdoor plants were left in the old apartment, which by the way we still own it and just rented it with those people whom we trust and know that would never wreck the place. It was one of those afternoons, that hubby has to go mow the lawn and perfect timing that the grapes we planted 4 years bare some fruits. This time, it wasn't as glorious as the first 2 years we have it. This is the decent fruit I found in the grapes and I felt so bad that we wish we could take care of it more than just leaving were it was. I do hope so that next year, there will be more fruits.